Yesterday Pope Francis I celebrated his first Easter Mass as the leader of the world’s 1.2 billion Roman Catholics. In his first “Urbi et Orbi” speech – Latin for “to the city [of Rome] and the world” – he called for peace in the Middle East; an end to human trafficking and greed; preventing the exploitation of natural resources; and protecting animals by becoming “responsible guardians of creation.” The Pope normally gives two Urbi et Orbi speeches each year where he deals with major challenges faced by the world and Christendom. In a future speech it has been predicted that he will discuss a unique challenge that the world faces according to the authors of a new book. In Exovaticana, Chris Putnam and Tom Horn predict that the new Pope, Francis I, will soon announce the existence of extraterrestrial life, among whom an alien savior will emerge to reinvigorate Christian teachings! Putnam and Horn, successfully predicted in their last book, the best-selling Petrus Romanus: The Final Pope is Here, that Pope Benedict would resign rather than die in office. They based their prediction on St Malachy’s, Prophecy of the Popes. According to Putnam and Horn, Francis is the final Pope, “Petrus Romanus”, who will oversee the dissolution of the Catholic Church as predicted in St Malachy’s prophecy, by announcing an extraterrestrial savior. Perhaps it’s not so far-fetched to see the Second Person of the Trinity, the Word, Who was present “In the beginning” (John 1: l), coming to lay down His life and take it up again (John 10: 18) not only as the Son of Man but also as a Child of other races? Both Funes and Consolmagno are scientific advisors to the Pope and advise him on all matters concerning astronomy – which includes the likelihood of a future discovery of extraterrestrial life. It’s inconceivable that both Funes and Consolmagno would have been able to make public their beliefs about extraterrestrial life without the approval of the previous Pope, Benedict XVI. It is highly likely that the Vatican astronomers will continue to be given permission to make statements about extraterrestrial life and its theological implications. So is it pure science driving these statements from Vatican astronomers or something else? As scientists gather to discuss progress in astrobiology, we still only know of one planet with life: our own. But there is a palpable expectation that the universe harbors life and there is hope that the first discovery is only a few years away. Because the mentality…amongst those who [are] at the…highest levels of Vatican administration and geopolitics, know…what’s going on in space, and what’s approaching us, could be of great import in the next five years, ten years. 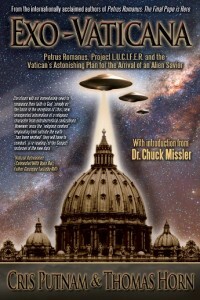 On the question of what precisely is being tracked, Putnam and Horn claim that “people familiar with Malachi believe he may have been referring to a near-future arrival of alien intelligence.” The aliens will be carrying with them a message that transforms Christianity from an earth-centric faith system into a new galactic faith that welcomes extraterrestrials as our “spiritual brothers”. Who will be the savior that emerges from the incoming extraterrestrial object secretly monitored by astronomers that, if Putnam and Horn are correct, the Vatican is preparing to soon announce in an “Urbi et Orbi” speech to the world? Lightning strikes Vatican after Pope resignation: harbinger of Papacy’s end? ← Are aliens guarding President Obama?